There is a huge list of benefits behind this incredible food. 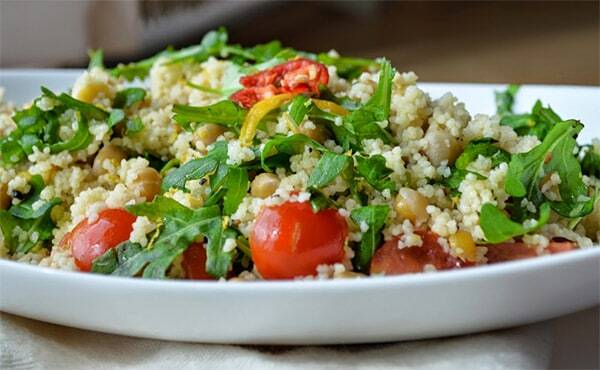 There are many ways to prepare a delicious couscous and this one is probably my favourite one! It’s perfect for vegetarians and vegans and all those looking to eat something healthy for a change. However, the almost neutral taste of couscous gives you the opportunity to play around with the ingredients and prepare your special combination. That’s exactly what makes this dish so special. It also goes perfectly with almost everything – different meat, stews, or even baked potatoes. Give it a try! Dry fry onion in a non stick pan. Stir in cous cous. Add tomatoes, water, herbs and corn. Bring to boil, reduce heat, and cook for four minutes, stirring constantly. Add peas and chick peas. Serve with a large green salad.